Marcus has a lovely cast, a direct walkup and is thoughtful and natural on his stock. His great strength is in his smooth transitions, seamlessly flowing from flank to walkup to stop to movement, keeping the stock quiet and maintaining steady pressure. He is running successfully in Open. After years of being my third dog behind Song and Levi I decided to prioritize Marcus in entries. With a just a bit of trial mileage he quickly stepped up to the plate. We're learning to work well together and he's currently my best trial dog and a solid farm dog. I've never had a dog try harder for me, never. This is a son of Levi, a grandson of my Cato. Cato was named for the Roman statesmen and philosophers, Marcus Porcius Cato (Cato the Elder) and his grandson Marcus Porcius Cato Uticencis(Cato the Younger). Marcus' mother Fly is a full time cow dog working in the dairy. 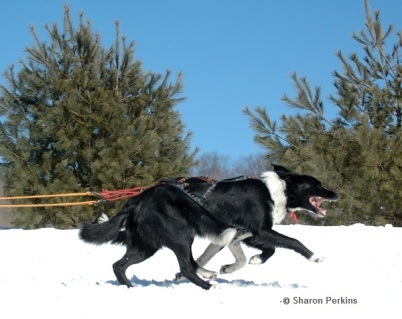 Marky runs in lead on my sled team.